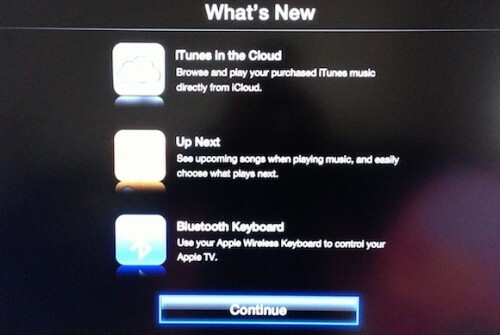 - iTunes in the Cloud: Browse and play your purchased iTunes music directly from iCloud. - Bluetooth keyboard: Use your Apple Wireless Keyboard to control your Apple TV. - AirPlay audio for videos: Send stereo audio from movies, TV shows, and other videos on Apple TV to AirPlay-enabled speakers and devices (including AirPort Express and other Apple TVs). It is interesting that Apple has issued three different updates for the Apple TV, covering not only AppleTV3,1 and Apple TV2,1 models, but also a new version codenamed AppleTV3,2. It is unknown yet what the difference is between these versions, but the numbering scheme indicates that there is a minor change. Sources also noted that Apple refers to the new model of Apple TV with a code name J33I, while the third-generation model is codenamed J33. There is no direct evidence, but it is possible that the "I" just refers to an international version of the current box.